Yesterday, I harvested the first watermelon from our garden. It seemed ready to pick, as it looked right, sounded right, and seemed to have stopped growing for the past week. Well, it ended up being pink inside and not quite ripe. It did at least still taste a little like a watermelon and was not bitter, but it also was not sweet at all. Oh well, we still have almost ten at various stages of growing, so maybe I will figure out when they are ready for at least one of them. I finally have a few Vinylmation figures. When I first saw them in Disney stores last year, I did not really like them much less want any other than I did actually buy one at the D23 Expo last year, but that was mostly because it came with a pin I liked. However, ever since I moved into the Master Bedroom and made it themed Disney I have wanted to get some Vinylmation to put on the ledge. The collection started with the ice Vinylmation that I only got because I wanted the ice cube mold it came with. It was not really a collection, though, until I got some more in Disney World earlier this month. 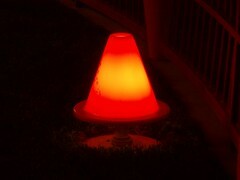 Now I also have a big red light one, a 2012 one, and a Norway flag one. Eventually, it would be cool to have them all across the ledge, but I am being pretty picky on the ones I get and the only ones out now I do not have that I want are ones that I am probably going to have to get on eBay because they are old like the bowling one and/or come in mystery box sets. After getting back from Walt Disney World late Wednesday night (a whole day early actually! 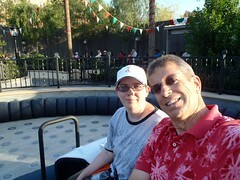 ), Dad and I went to Disneyland on Saturday and Sunday. 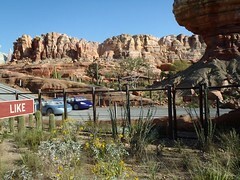 We were supposed to end up home a whole week between going places, but I could not pass up buying the Cars Land preview tickets. It ended up being totally worth it, although we did not get the private World of Color show as expected. Saturday we finally got to Disneyland around 7 p.m., as we left Tucson later than planned, stopped quickly at Joshua Tree National Park for a stamp for my national park passport, and made a few stops at stores for Shopkick walk-ins along the way, too. I got my new annual pass, since mine and Mik's expired in Disney World. This year we are just getting Disneyland premium ones, as we are not planning to do Disney World again at least until Christmas 2013 or later. Dad's premier pass is good until April, since I only just got his when we did Disneyland in April and knew we had a Disney World and at least one Disneyland trip coming up. Saturday night Dad and I went into Disneyland for a few hours. We enjoyed dinner at my new favorite, the Jolly Holiday Cafe, and went on Buzz Lightyear and Haunted Mansion before escaping before the Fantasmic and fireworks exit crowd. Sunday we got a late start not getting to the parks until noon, but that was okay since the event was 6 p.m. to 11 p.m. and we knew we would likely stay for the whole event. Plus, we thought World of Color was supposed to show after the event and thus it would be a until midnight at the park night. 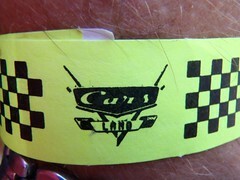 The first thing we did was picked up our cool Cars Land wristbands. We then headed into Disneyland to do some rides. 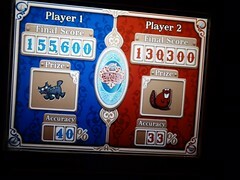 We ended up just doing a few Fantasyland rides (Snow White, Alice in Wonderland, and Mr. Toad). Also, discovered the salmon salad at the Harbour Galley by the Rivers of America. 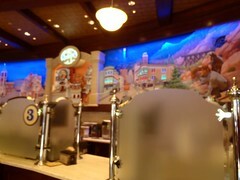 After lunch we headed over to California Adventure to check out the new Ghirardelli Soda Fountain and ride Toy Story Mania. It was fun to get a free chocolate square and while frozen white chocolate mocha is not cheap it was tasty and refreshing on the sunny day. When we go back for Mik's birthday in a few weeks, I am going to try the Gold Rush sundae (peanut butter sundae), as that looks awesome and I did not notice it until after I ordered my mocha and I was still full from lunch anyways. After a ride on Toy Story Mania, it was around 5 p.m. and while our preview time was not supposed to start until 6 p.m. we decided to go line up anyways. The line was already all the way across the Pacific Wharf and starting to wrap up towards the other bridge. Good thing we lined up early, though, as by 5:20 p.m. they started letting us in and we were actually on Radiator Springs Racers for our first time by 6 p.m.
Radiator Springs Racers is an awesome ride and made it totally worth going for the preview. 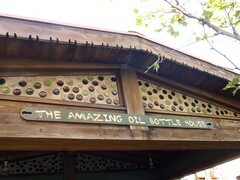 The first thing I liked about it was the Amazing Oil Bottle House part of the queue, which has colorful oil bottles in the walls. The coolest thing, though, is there are some glass insulators up on the top shelf inside. 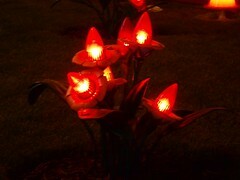 It totally gave us some ideas of things to do with the ~600 glass insulators I have sitting in storage. 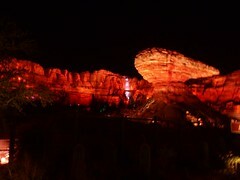 Of course, the Radiator Springs Racers ride itself was a lot of fun, too. 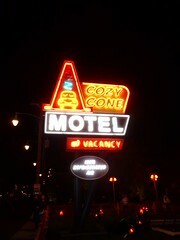 You go through Radiator Springs and before getting ready for the big race. For the race, we ended up going through a spray paint area, which is made to light up and look like it is spray painting the color of the car you are in, so it changes depending on the color car you are in. At first I thought this was the only pre race preparation, but we later learned there was a tire changing thing for the left side car. Once both cars are ready, you race each other and it random which side will win. 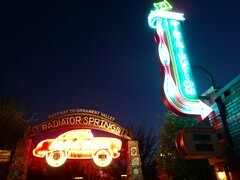 After our first ride on Radiator Springs Racers, we headed over to Luigi's Flying Tires. 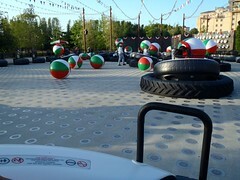 This is a rather odd ride where you get in a giant tire vehicle and air makes them float. You shift your weight to control it to basically do bumper tires. There are also giant beach balls to pick up and throw around if you want. An interesting ride, but not all that exciting. Before going on the third ride in Cars Land, we strolled through the shops and I only picked up one thing (a Cars Land antenna topper). 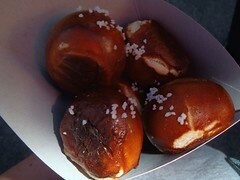 I also got some pretzel bites at the Frozen Cone-Coctions cone at the Cozy Cone Motel. 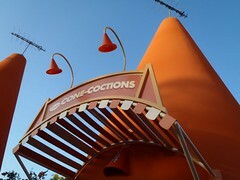 They were good, but I was annoyed that the cone places do not give the annual pass dining discounts. 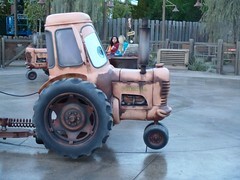 The final ride in Cars Land is Mater's Junkyard Jamboree. It is a wacky tractor ride. The tractors go in circles and switch tracks as you go around making the cart swing side to side. It is really hard to describe, but it is crazy and fun and the video I did while riding is below. After trying out all the rides, we went back to Radiator Springs Racers and rode it again and again with one short break to take photos of Cars Land lit up at night until our final ride ended about 10:45 p.m. By the end the wait was pretty much nothing, so we got in at least 7 rides on Radiator Springs Racers (yes, more rides on one ride in one evening than I did the whole six days at Disney World! ), which is awesome considering they are expecting 5 hour wait times when it opens. I totally plan to fastpass and ride when we go for Mik's birthday, but we are not waiting that long for it. We could have kept going until 11 p.m., but we thought there was a World of Color showing. We headed over there and found out they canceled that a week ago and instead we were supposed to get fastpasses to the 10:15 p.m. show. I am kind of annoyed I paid $25 extra for a private show that did not happen, especially since no one told us about the early time because we did not get the fastpasses at check in. However, we did go to guest services and I can pick up two fastpasses for the blue section first show any of the dates we are going to be at Disneyland in a few weeks for Mik's birthday. Not sure I will use them, though, as we already are doing the dining package at Carthay Circle for his birthday. The preview was still totally worth it and not going to the 10:15 p.m. show ended up making the lines shorter at Radiator Springs Racers, but I could have gotten in a few more rides if I knew there was no show (I would not have gone at 10:15 p.m. if I had known because it was the public show, which is nothing special like a private viewing might have been). Can you really do 6 full days at Disney World going on only 4 rides? Believe it or not, this year I spent way more time in the parks than our trip last and not just because we decided to skip trying to do Harry Potter at Universal and spend an extra day at Disney World. Last year, Mik and I would spend the morning in the parks and do a few things and then I would go back for evening hours including doing a lot of Magic Kingdom rides until 1 a.m. on day. This year, though, I seriously only went on 4 rides. The first night Dad and I quickly went to Hollywood Studios and did Toy Story Mania (ride #1). The next day we only got to Epcot and did not do any rides there. The next day we went to the Magic Kingdom and I got hooked on Sorcerers of the Magic Kingdom and did that all day besides when we had lunch in the castle (Dad took Mik back to hotel after lunch and quested the rest of the day with me). The next day I also mostly just did Sorcerers of the Magic Kingdom, but I also went on Snow White's Scary Adventures (ride #2). I could not pass up riding that on its last day even though it still will be at Disneyland. The following day we again went to Hollywood Studios and this time it was Star Wars weekend, so not only did we go on Toy Story Mania, but also Star Tours (ride #3). Then, I spent the rest of the day doing Sorcerer's of the Magic Kingdom some more. The next day was another day of mostly Sorcerers of the Magic Kingdom, but I did go to Disney Quest and I guess those may count as some rides over the 4. Also, I quit around 7 p.m. and finally went mini golfing at Fantasia Gardens, which is something I have wanted to do in 2007 and 2011 and did not get around to. Plus, at this point Dad had traded all our extras and we had a complete set of spell cards or at least we thought so. This was supposed to be our final day at Disney World, as Mik and my Premier Passes expired that day. However, we still had a full day and night in Orlando before leaving since we originally were going to do Harry Potter world, but decided it was not worth it. Thus I spent one more final day doing Sorcerers of the Magic Kingdom, as I got a one day one park ticket while Mik decided to use his Universal money to go to a fork and dine movie with Dad. I almost quested for the whole day because that morning we realized somehow we never got the Wall-e card and I kind of wanted to get it. Plus, it is just so much fun, although a lot of walking and standing. I finally ended up quitting around 8 p.m., but not before I traded for a Wall-E and an extra Simba (the one card Mik wanted besides the Grumpy he got from his first pack). Oh, and I actually did fit in a ride on Winnie the Pooh (ride #4) on the last day. I kind of considered hanging at the park until it closed at 2 a.m. for rides (Sorcerers closes for turning in quest at 10 p.m. that day) when I started the day, but my feet were really hurting by the time I quit the questing. Instead, though, I challenged Dad to two more rounds of mini golf. So, yeah, I really only went on 4 different rides the whole trip, but it was the first time I really enjoyed Disney World. All the other times it is has been like this is not anywhere near as good as Disneyland because most of what we like is also there and you do not have to take forever going between the parks to do the stuff. This time, though, it did not seem so bad because I mostly just wanted to go to one park and the lines at the portals were rarely like waiting in line for a ride. Going into this trip, I had no plans to go back to Disney World for a long time, but I sure am going to be keeping tabs on if they expand the game, especially if they release new cards, and that would definitely get me thinking about planning another visit. Now if it just came to Disneyland that would be dangerous, as I already end up with enough random trips there considering we are going this weekend because I was able to get Cars Land preview tickets as we were driving to Florida. 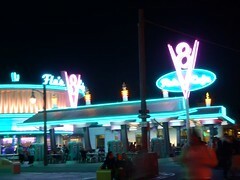 And, yeah, we are also still going there later this month for Mik's 18th. I guess having those Disney trips coming up kind of contributed to not riding at Disney World because I figure I can do all the rides then, as the main ones I like are also there.